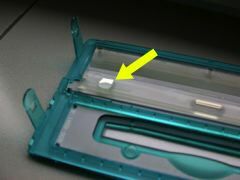 Remove the door's cache (this photo was made with the burner already in place !). 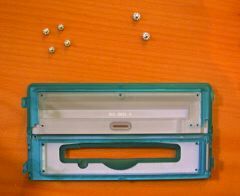 Remove the 4 screws which lock the drive inside its craddle. 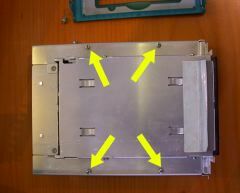 The 4 screws which maintain the CD drive inside the craddle, the two ones which fix the craddle in the Mac's chassis and the two caches. 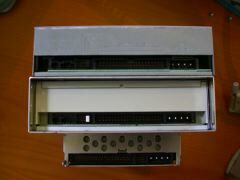 The burner in place and the old CD drive on the top of the craddle: connectors are located exactly at the same place in both the drives. Following the above instructions in a reverse order, we can rebuild the machine (pay attention the to connectors at the rear front of the burner). 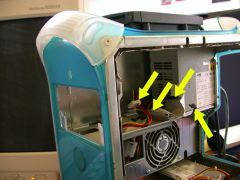 Just a little detail (yellow arrow): the opening button on the burner's cache. 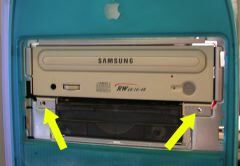 In my Samsumg burner, the opening button was circular and not proeminent at all. I cannot activate it through the cache's opening button. 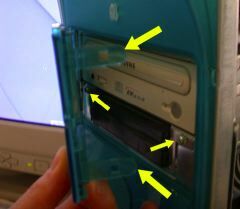 So, in an old CD-R, I cut a small piece I glue onto the cache's button to fill the missing gap between this button and the burner's button.